The secondary bond market yields were seen increasing further yesterday on the back of continued selling interest. The yields on the liquid maturities of 01.08.21, two 2027’s (15.01.27 & 15.06.27) and 01.09.28 were seen hitting intraday highs of 10.95%, 11.30% 11.37% and 11.36% respectively against its previous day’s highs of 10.86%, 11.28% 11.30% and 11.32%. In addition, the 15.12.21 and 15.12.23 maturities were seen changing hands at levels of 11.00% and 10.971% to 11.03% respectively as well. The total secondary market Treasury bond/bill transacted volumes for 6 February was Rs. 5.27 billion. In the money market, overnight call money and repo rates averaged 8.99% and 9.00% respectively as the OMO Department of Central Bank infused liquidity by way of an overnight and a seven-day term reverse repo auction for successful amounts of Rs. 24.9 billion and Rs. 10 billion, at weighted average yield of 8.99% and 9.00% respectively. The net liquidity shortfall increased further to Rs. 103.82 billion. The USD/LKR rate on spot contracts depreciated marginally yesterday to close the day at levels of Rs. 177.75/85 against its previous day’s closing levels of Rs. 177.65/80 on the back of buying interest by banks. The total USD/LKR traded volume for 6 February was $ 136.34 million. 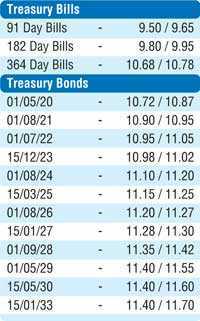 Some of the forward USD/LKR rates that prevailed in the market are 1 Month - 178.55/75; 3 Months - 180.40/70; 6 Months - 183.30/60.